Diporto is probably Athens’ oldest taverna. Owner Dimitris Kololios came here as a kid to work as a helper over 60 years ago. Chatting over inexpensive food while the house wine flows is an inextricable part of Greek social life and Athens is no exception. The authentic taverna has been a confessional, a haven, a mini-agora where thoughts and ideas are exchanged, a place to express grief or mirth. It is a place where class distinctions are eliminated as there are no expensive options. Everyone drinks the same, choosing only between white, red and maybe rosé house wine. 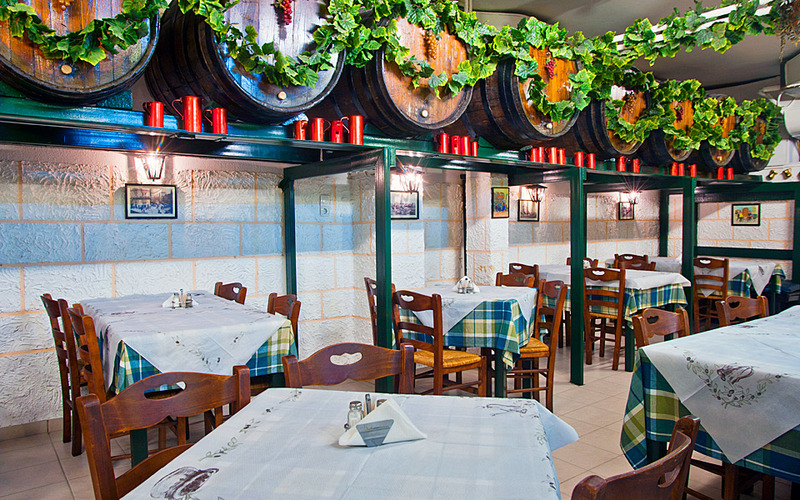 Wooden barrels are a common motif as wine is at the core of the taverna experience. Up until the 1950s, tavernas were relegated to basements. They were the hangouts of outsiders, blue-collar workers, artists and outlaws. It was not until they were discovered by middle-class intellectuals that they were elevated to the ground floors and courtyards of houses and apartment blocks. In one such courtyard, near the Panathinaikos soccer stadium on Alexandras Avenue, you’ll find Trifylli, or Oinomageirio as it’s known by most, between two small buildings – one the taverna itself and the other the home of the family that owns it. It’s been around for 58 years and is fabled to have started as a small grill house serving souvlaki to hungry soccer fans after a game. The menu now includes stuffed vine leaves (dolmadakia), fried liver, batter-fried cod with garlic puree and its famous keftedakia meatballs. Service is strictly from 20:30. You won’t find it in any guidebooks, but it’s 100 percent worth a visit. Kottarou used to be an open-air poultry farm which gradually became a taverna. In contrast, mentioned in most tourist guides and popular with foreign visitors is Klimataria, located in a covered courtyard and decorated with wooden barrels and ivy. Maria is the heart and soul of the establishment, a cook with attitude. The owners are especially proud of their wine and homemade bread, while they also make good casseroles and baked dishes. You may be lucky to come on an evening with live music from a band playing old rebetika tunes. In the same neighborhood in the city center, Diporto is known for its good food, but even more so for its ambience. It’s located in the basement – a time capsule that seems to come from the pages of a novel or a 1950s film set. 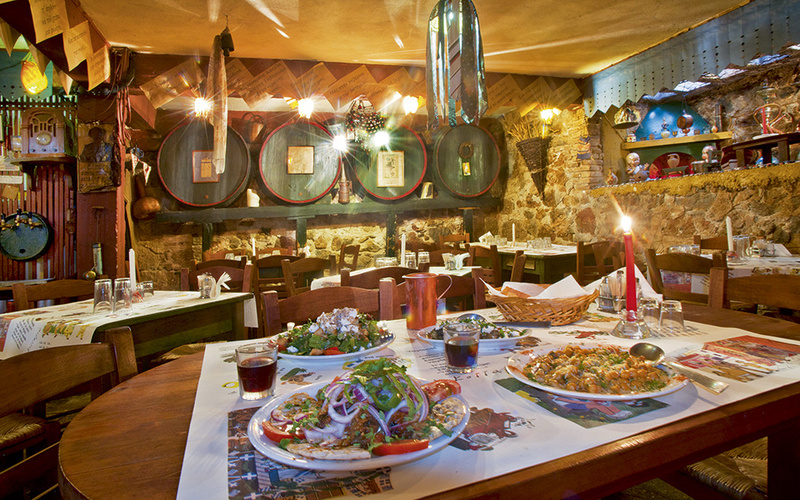 With historical references dating back to 1911, this is probably Athens’ oldest taverna. Located near the central market, it has a wonderful vibrant atmosphere, with people coming in and out, jostling for space at one of the cramped tables – but no one complains. The chairs are wooden and the tablecloths made of greaseproof paper, perfect for a quick clean-up and scribbling orders. The food is basic and authentic, with staples including an excellent chickpea stew, potatoes cooked in tomato sauce, wild green salads and cheap fish. The owner, Dimitris Kololios, came here as a kid to work as a helper over 60 years ago. You’ll spot him by his white shirt-apron. Another unique example of the taverna species is Kottarou. In 1885, the area known as Metaxourgio and Kolonos today was just open space with fields. In one spot, near Larissis train station, was an open-air poultry farm. Cart drivers would come by to pick up orders for delivery to Athens, stopping for some wine as they waited. As the years went by, the farmer started preparing small snacks to go with the wine; then he added a makeshift roof and enriched the meze menu, until in 1950 the whole thing was enclosed in stone, in the basement, of course. The hen house remained in the taverna until 2011. The chorus of boisterous patrons and the absence of adequate lighting make for a mystical atmosphere. 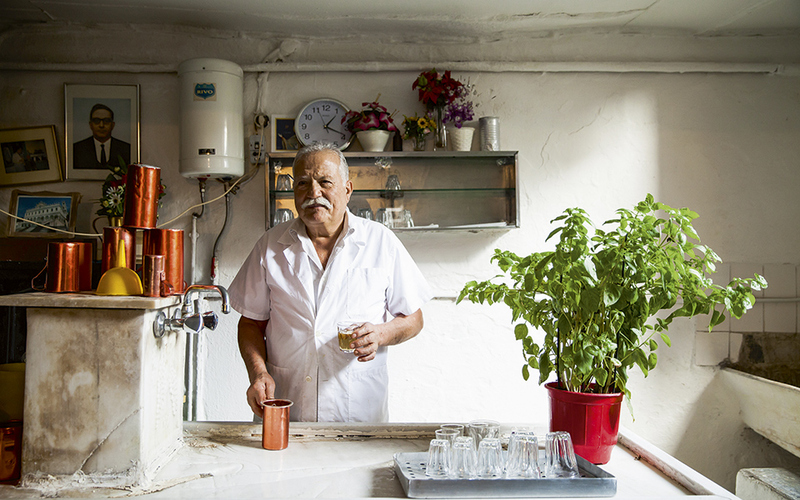 Specialties include fried chickpeas, smoked eggplant and a minced-meat pie called boxa. Two old-school musicians play Greek tunes, live and unplugged. Service starts at 20:00. Ramona is probably Athens’ only after-hours taverna. Some tavernas started out as grocery stores, selling cheeses, cured meats and wine, and also serving blue-collar workers after a day on the job. One of the last surviving grocery-taverns in the broader area is Eidikon in Piraeus, in the same spot near the port since 1920. Its refrigerator could be a museum piece; the mosaic on the floor a well-worn gem. The menu includes salad, sardines, a mature graviera cheese, fava bean dip, meatballs, fried liver, sausages and a famous omelet with corned beef. Every so often, groups turn up with musical instruments and, if the vibe is right, all the tables will join in song, well into the night. The sound of song spilling out into the streets is also a regular occurrence every Thursday at Ramona, probably Athens’ only after-hours taverna, located in the same basement since 1974. Service starts at 14:00 and can go on till 4:00 on weekends. The after-hours clientele consists mainly of people working in the bars in the vicinity and often their booze-soaked customers. The decor consists of plastic grapes and ivy hanging from the ceiling and winding its way around wooden wine barrels, while the food can be described as above average compared to most typical neighborhood tavernas. The menu is huge and the service very rapid. Try the beef stew, stuffed cabbage and grilled meats. Dessert is on the house.